This page contains all BlogArizona posts related to Payson, Arizona. Read a specific post by clicking on a title below, or scroll further down the page to read through all posts in this category. I'm really sick of looking at this really old post about the Federal Reserve and interest rates so I'm posting an update! At the end of June, the Federal Reserve met and decided to keep the federal funds rate the same at 0 - 0.25%. The federal funds rate is the rate banks charge each other. This was really no big surprise, as most economists expected the Fed to leave the rate alone. It hasn't changed since December 2008 and isn't likely to increase anytime soon. The Fed says that the pace of economic contraction is slowing and there's evidence of household spending stabilizing, but inflation does not seem to be a worry to the Fed right now. Arizona Homeowners: Bee-ware of Bee Hives! 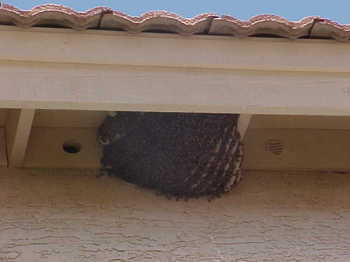 I found this beehive while doing a home inspection in Phoenix yesterday. If you ever see a beehive like this, stay away from it and call a professional to have it removed. 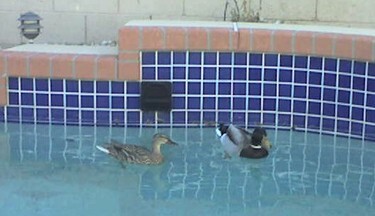 Arizona Snowbirds in my Swimming Pool? Okay, these may not be the type of 'Arizona snowbirds' you were expecting... But early this morning, we found an Easter surprise in our swimming pool. These two ducks decided to use our pool as a free hotel. They spent a couple hours drinking, bathing and resting in our pool before continuing on their journey. I'm no bird expert, but we figure they probably needed a place to stop and rest as they were migrating home (heading back north after flying south for the winter?). My kids were hoping they were an Easter present. My cats were hoping they were dinner. And although they were kind of fun to have as guests for a couple of hours, I'm just glad they're gone!